homemade strozzapreti ready for the boiling pasta pot. 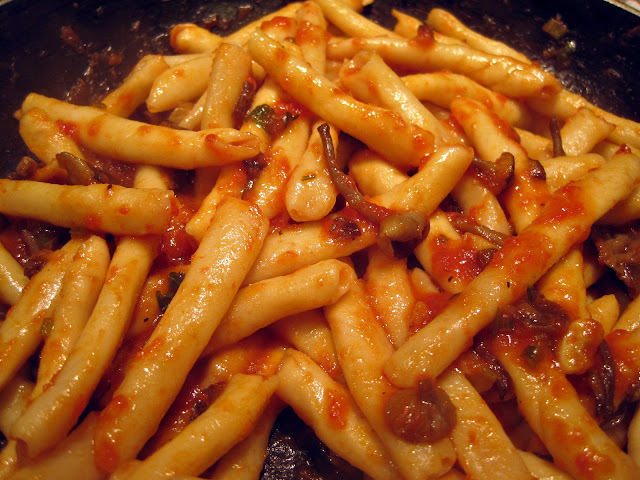 Strozzapreti pasta is translated as “priest choker” and is an elongated form of cavatelli. 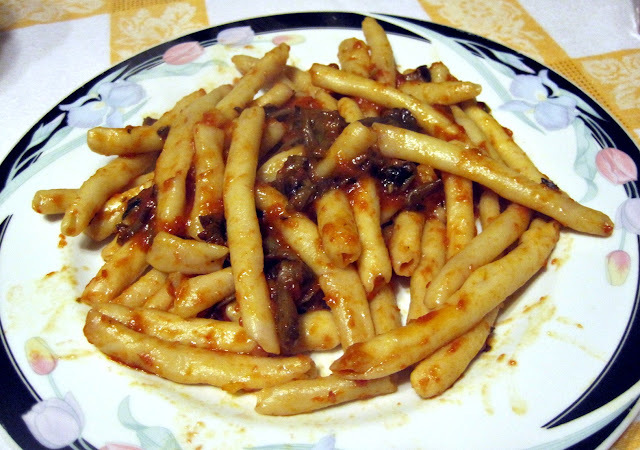 The legend has it that the priests of Emilia-Romagna and the surrounding regions enjoyed the long pasta so much that they choked while eating it. I can certainly understand eating strozzapreti quickly as it is, indeed, a delicious pasta. 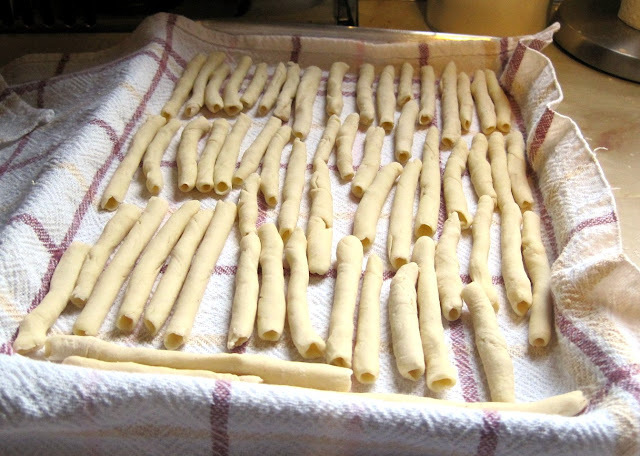 Strozzapreti is a fairly straight-forward pasta shape to make at home and the process begins by rolling pasta dough (you can use our standard pasta dough recipe) into a paper-thin sheet and thereafter scoring it with a knife into 1-2 inch wide strips (about 4 inches long). Thereafter, the strips are rolled onto metal or wood skewers (we used a 1/4 inch wood skewer). We consumed our homemade strozzapreti with a wild mushroom tomato sauce / ragu. The sauce is easy to make and starts with our homemade tomato sauce with the addition of pan sauteed wild mushrooms. The mushrooms should be sauteed with garlic and good extra virgin olive and then added to the pot of finished homemade tomato sauce. Generally, strozzapreti works well with a thicker and abundant sauce or condiment. 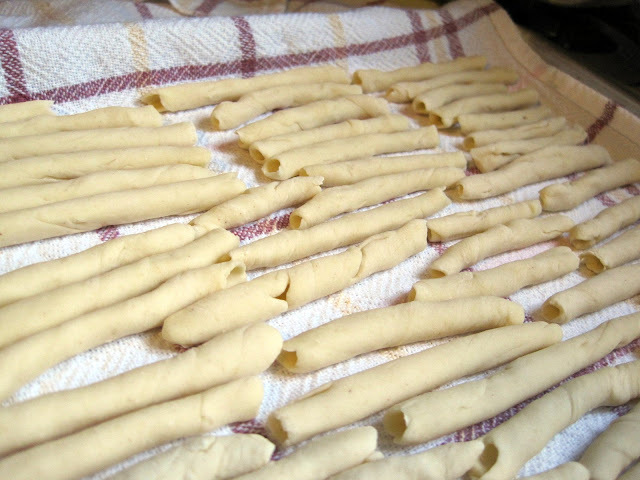 closeup of Strozzapreti - the shape is achieved using a metal skewer to wrap the pasta strips. What was the diameter of your skewer? I want to try these! Hi Michelle, I just updated the article with a link to the skewer we used (it was 1/4 inch, but you can use any size). You’ve done a beautiful job. I bought a metal skewer just for this purpose, but I haven’t attempted it yet.